Our homeland, the Philippines, is recognized as the only Christian country in Asia. However, whether we Filipinos can claim to be truly following, imitating Jesus Christ and living as "good Christians" is arguable. (Am not covering Muslims here). Functionally speaking, religion is supposed to give meaning to one's life and to be a source of ethical behavior, in the personal and social (socioeconomic and political) areas. Unfortunately, it seems that we Filipinos in the Philippines and abroad can not claim to be really leading such expected Christian lives -most especially with regard to ethical behavior in our homeland's sociopolitical arena (government, business and military) as exemplified in rampant corruption, killings of journalists and activists, etc. Catholic Christians are a majority, but unfortunately, as such we generally do not seem to think and behave as truly good Christians in Philippine society. Filipino Catholics tend to be mainly observants of Catholic religious rites and church-made rules, tend to overspiritualize despite the Second Vatican Council's (1962-1965) agenda of "aggiornamento", of the church "bringing up-to-date": that is, of encouraging Catholics to attend more to social concerns, of applying righteousness in the treatment of the poor and most vulnerable in our society. Sure, the rites and church-made rules underwent changes, for example, how the Mass is performed; or when to observe Friday abstinence. But these are all mainly symbols of Catholicism and are externalities. Greatly missing in our Catholic Christianity are changes that define attitudes and behaviors as they might impact and shape how we, its members -the clergy and laity- engage in the world [i.e.Philippine society] or how to put our Christian faith to work in society. I think and believe that these latter concerns are more relevant and much more important [to our homeland's present predicament] than when one's Christian practices or religiosities emphasize only the attainment of great personal piety and/or following church-made rules. One Catholic Christian teaching that seems to continually and negatively impact Philippine society is the pronouncement of the Beatitudes that says "How blest are the poor...those who hunger and thirst for justice...Be glad and rejoice, for your reward is great in heaven." By repeatedly stating such, the impoverished Catholic Christians are made complacent and content, discouraged to fight for even a "small place under the sun", that is, for decent living beyond their mere existence and survival. Such teaching that emphasizes otherworldliness is to disregard and exhibit callousness towards the present hell of the poor. It is the major reason why Karl Marx more than a century-and-a half ago has stated that ".....religion is the opium of the people". I think and believe that the Catholic Church [the catholic hierarchy, its bishops, priests and laity] should stop this kind of preaching and thinking. The same can be said of mainline Protestants and evangelicals, especially the fundamentalist variety. The fundamentalists concentrate and devote their attention on the Bible, give themselves to its literal interpretations, and thus wittingly or unwittingly, make a book the object of their idolatry [do they realize this?]. By stressing that personal salvation is only between himself and his God, the fundamentalists practice detached or escapist pietism, and generally tend to withdraw from involvement in sociopolitical activism in society [recently a few of its ministers run for political office, which I think should not be entered into by church people]. They withdraw into detached pietism because their Bible says "enough of worrying about tomorrow and let tomorrow take care of itself." These words are great to hear and read if one is a member of the ruling class or the fortunate few who have money to afford conspicuous consumption, convenience, luxury et al., and thus be able to go on with one's merry ways. For them to proclaim or imply that the impoverished should not worry about his food for tomorrow, about his child's need for unaffordable medicine, to pursue his child's education, or his grandchild's future, etc. is by default to be in cohorts with the ruling elite and their foreign partners (TNCs) who want to perpetuate ignorance and therefore exploitation of the impoverished majority; by indirectly supporting the oppressors, they become evil and "bad Christians" themselves. Thus, the overall effect of Christianity in our homeland is to perpetuate a populace that is characteristically too passive, too submissive, too preoccupied with otherwordly and spiritual matters, which result in their inability to function effectively in worldly politics, to assert, claim and exercise their rights. These Christian "virtues" invite tyranny as Marcos has demonstrated. Two centuries ago, Jean Jacques Rosseau wrote with obvious contempt: "True Christians are made to be slaves, and they know it, and do not much mind; this short life counts for too little in their eyes." Filipino Christians, Catholic and Protestant, should do more than attend to their churches as institutions; they should do more than proselytize; they should do more than daily pray and praise the Lord (is the Lord that insecure and thus need constant laudatory attention? ). It is time for Christians to actively work to change Philippine governance, to make the government truly responsive to its suffering citizens -to help free them from extreme poverty, which in turn robs them of their human dignity. Christians should make their religious faith alive by not wasting time on, but discarding instead, their old-Reformation debate about "scripture or tradition" and instead work together to create a Filipino society that will materially and decently sustain the majority, if not all, of Filipinos and accord them with dignity and destiny as persons. Whenever we Filipinos gather and talk among ourselves, we all agree and lament about the sorry state of our homeland and our fellow countrymen. We fail to realize that we ourselves can do something, more than just being observers (if you can use the computer and access the internet, you can do "something"). Specifically, we can contribute and/or work to "conscienticize" ourselves and the impoverished, i.e. to raise (our) their consciousness, thus understand the institutions and systems that oppress them, to enable them to think critically as they interact in society with the sources of their oppression and to make them aware that they are important and of equal worth as persons [served well by the Basic Christian Communities during the martial law years]. 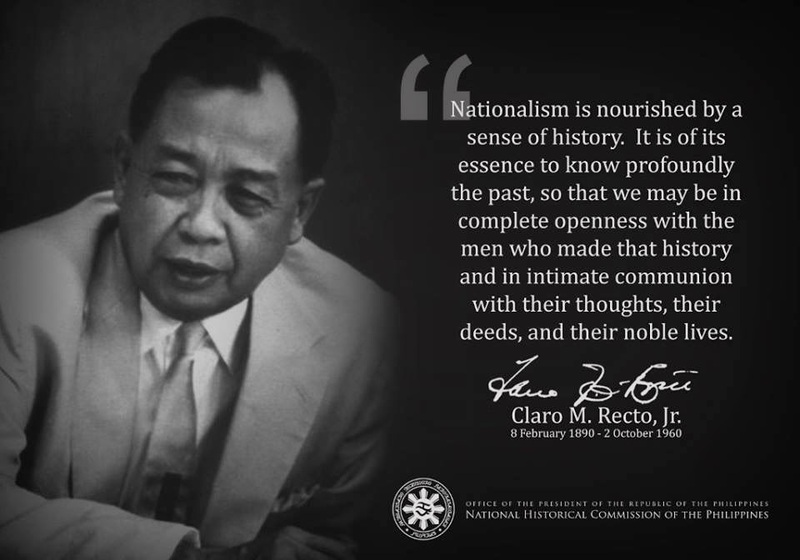 All Filipino Christians should work to improve Philippine society, to reform it and if necessary, to revolt against its oppressors [because society, more specifically - its state or government, is responsible for promoting the common good of the majority, if not all, of its members]. I don't think that doctrine or teaching you quoted explicitly is saying that the poor should just do nothing with their wretched condition or circumstances in life; that they should not do anything about injustice and just passively accept things that happen to them. On the contrary, it encourages people, the oppressed, to fight for and attain justice. It might have only been misconstrued or misinterpreted. The Kingdom of Heaven indeed belongs to the least among us: the oppressed, the marginalized, the broken-hearted, the victims of injustices, etc. But the evils in the world such as poverty, corruption, injustice, etc., are largely man-made, therefore they shouldn't be considered as "givens", but should be fought against. I do agree that most of us Christians are too passive and submissive to the concerns and issues of our country. That is what I think is missing. We are very good in following the rites, traditions and practices of our religion, but we don't really put our faith into more meaningful practice... But that is not to discredit the rites and practices of our faith. They are important, too, for personal spiritual transformation. And where does change begin, in the first place, but in the individual herself, in her personal spiritual transformation. That's where all change can begin - from the person, from his personal transformation, his spiritual growth, his cultivation and practice of virtues and ideals, graces that can only come from God. I don't agree with the Rosseau quote also. True Christians are made to be slaves? No. True Christians fight for personal and social justice. That's what I believe, anyway. When you are a Christian you accept and strive to practice all the virtues and ideals that Christ taught and exemplified. A true Christian does not accept injustice. He fights against it, because his conscience dictate that to him. Thank you for your comments. I say that you correctly saw "misinterpretation" of Christian teachings as the probable cause. And unfortunately, since the mass and the faithful practically rely on the clerics and pastors, their understanding is based on the latters' interpretation of the gospels/bible. Historically, much of western social evolution demonstrated - until the advent of humanism/secularism; and among us Filipinos, here and abroad, still demonstrate an attitude and behavior that can be generally attributed to such misinterpretations. Such typical attitude and behavior were observed by Rosseau, Marx, Napoleon,etc. and thus their often quoted and famous commentaries about Christianity or its impact on christian believers. Am curious about what you see or understand as the "Kingdom of Heaven"? Also, why is this sense of social responsibility still absent among us Filipinos, and if my inference is right, how do you think rituals can aid in the transformation to materialize in a person and by implication, in the long-run, society? I agree. I think the bottomline is that, the way I see it, Christianity, misinterpreted and distorted, has indeed been (or continues to be) the "opium of the people". But it is or has also been a source of positive things for people, when it is rightly understood and practiced. What I mean by "Kingdom of Heaven" is simply that, Heaven. I do believe there is such a place, promised as it is in the Bible. Or, I do believe that there is a rational basis for Christianity, about the existence of God, and Christ's resurrection. Jesus in His teachings talked a lot about a Heaven and a paradise beyond the material world. I believe He proved all His claims with His resurrection. I understand rituals to mean our religious practices like praying, praise, worship and adoration (I remember you mentioned that God has no need of our praises as he is not vain, or something like that. The way I understand it, it's not that it's God's need; rather, it's ours. We place ourselves humbly before Him and we acknowledge His power and greatness in our lives when we praise Him), going to Church, receiving the Sacraments, etc. I know so little about my religion, but from what I understand, these rituals and practices bring us closer to God and His graces, and help us to develop character and cultivate virtues... Of course, many fall short of this ideal (as it is a struggle). The practices of our faith sometimes is reduced to mere routine by many of our countrymen. We then should, individually, make a decision to make our faith meaningful. We should dig deeper to our religion and find the basis for our faith, or the foundation for our hope. If we truly understood our faith, it would naturally translate through our actions. As to why a sense of social responsibility is still lacking among us, I really don't know. It could be that we failed to understand and practice our faith, thus we have a very shallow kind of morality. Or it could be that the Church failed in instilling in us a healthy and strong morality that sees a relationship between injustice in the social level and injustice in the personal level and sees the need to act to change things for the better. That's a good, interesting and honest exchange of ideas we just had; we'll have more of this God-church-society talk and other matters as well as we go on.